Non sailors – please read on, you might learn something for a quiz night. Sailors will probably (hopefully) already know this, but you would be surprised at how many people launch their boats at the yacht club and then sail right over the top of the reef nearby which is clearly marked with a lighthouse and a cardinal mark. The reef actually extends quite a lot further south from where the Eastern cardinal marker is, so more than a few people have inadvertently hit it, even when they have been fully aware of its existence. These are marking an isolated area of danger, and they indicate what side you should pass. So if you see a South marker, then you should pass to the South of it. Of course you do need to know where South is – so have a look at the compass or the chart if you are unsure. There are a few easy ways of remembering which is which – and the lights on top. First of all the lights are always white and they are either Q = Quick or VQ = Very Quick flashing. East – one arrow points up and one points down. I remember this one as it kind of looks like an Egg – Egg = East and the light flashes in groups of 3 – just like 3 o’clock on the face of a clock. 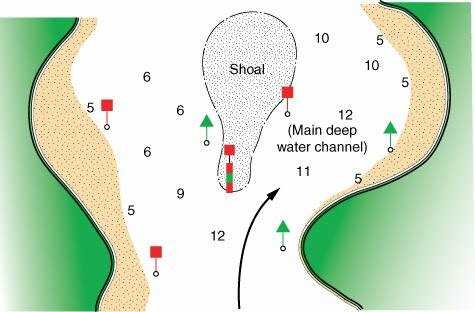 Lateral marks identify the channel going in to the harbour – or in the direction of the flood tide. Just to confuse everyone, there are two systems IALA region A and region B. New Zealand, UK, Europe are system A and North & South America and some parts of South-East Asia use region B.
I remember the shapes because of course port is red, and the shape is a can, which beer comes in – beer & port are both alcohol. Keep them on the left when you are coming in to a harbour. 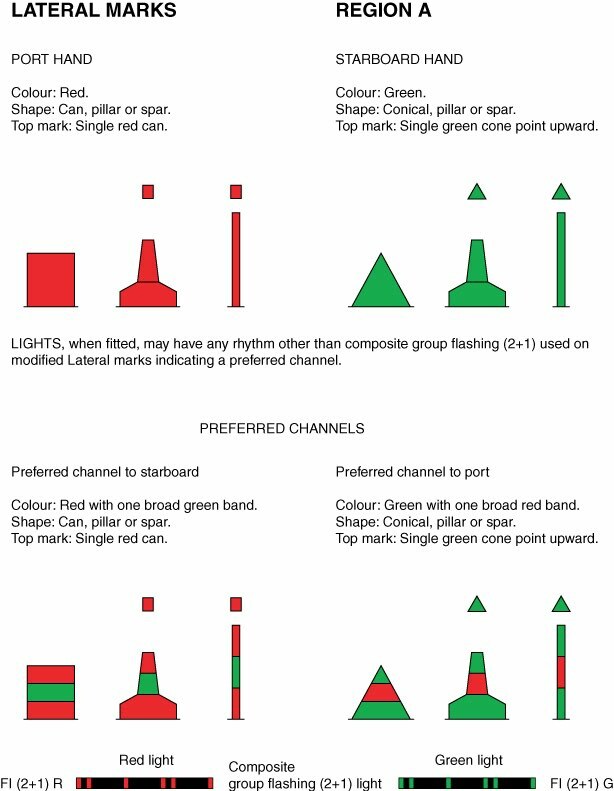 Green = starboard, and the shape is like a cone, cones kind of look like a Christmas tree shape. Christmas trees are of course green, and green is starboard and so keep that one on the right hand side when you are coming in to harbour. Their lights will either be red or green as above, and can have any kind of flashing sequence. Check your chart as it will tell you. These are identified at night with a composite flash – which is two flashes and then a gap and then one flash. IALA B differs in that the shape of the marks is the same as A but the colours are different! Arraagh! I haven’t worked out how I am going to remember that…?! There are also isolated danger marks, special marks and safe water marks to keep an eye out for. Isolated danger marks are red and black with two black balls at the top. They flash white in groups of two. They indicate a relatively small danger in a patch of clear water all around. You can pass either side of these. I remember these as two black balls look like two black eyes – and no one likes to get a black eye, let alone two of them, so stay away! Special marks are yellow and we have got one at the end of Lyttelton Harbour and it marks something – actually I am not sure what it marks, but it can’t be bad as we use it as a race mark. 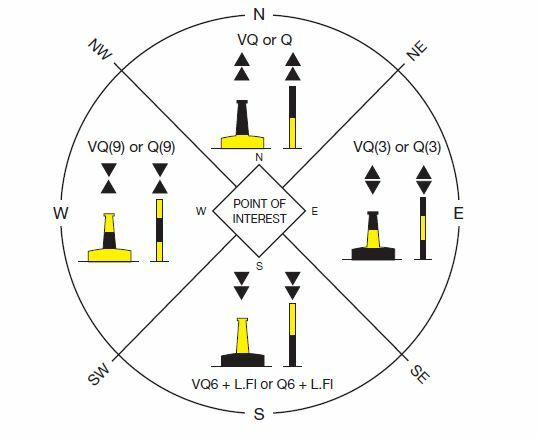 In fact I have even just looked it up on Navionics, and it doesn’t tell me there either what it is for. Anyway what it does say is that it has a yellow flashing light and a period of 5 seconds – so I presume that goes: flash! – followed by a pause of 5 seconds – flash! So anyway they are special – the X reminds me of a pirate map – X marks the spot, and there is usually treasure underneath, and treasure is pretty special it also usually has gold which is kind of yellow, so yellow X = special mark. There are also lighthouses and leading lights and their various different flashes and colours, but I am going to talk about those in another post. Of course don’t assume that all dangerous rocks and channels are going to be marked. The ones that are marked are mainly for the benefit of big ships, so when you head off in to a small bay its unlikely that there will be any marks at all. When we were in the Marlborough Sounds the other day, two cardinal marks indicating the ends of dangerous reefs were missing as they had been damaged in a storm. They did mention this in the local weather forecast, but you still need to keep a good eye on the chart in case they aren’t there. Anything I have missed or do you have any other creative ways of remembering marks & lights? I would love to know! I always learn so much about sailing from your posts. Thanks! My sailing buddy taught me the “Red Right Returning” phrase when coming into harbor here in North America and the Caribbean. Maybe that will help. Fair winds and safe travels!